Spyderco knives are basically pocket knives with an ergonomically designed handle for better grip and a pocket or belt clip for more convenient carrying, although there are also non-foldable Spyderco Knife options available. 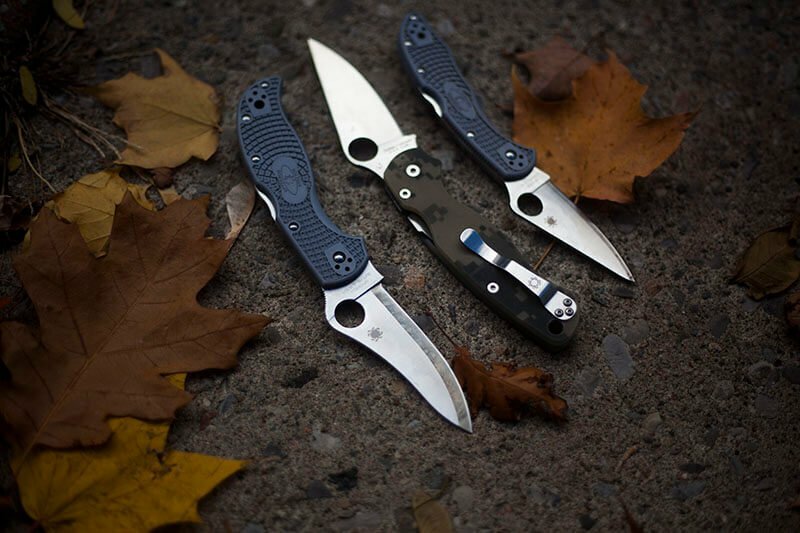 Spyderco EDC Knives uses some of the best available steels in the industry along with the proper heat treatment of the blades to manufacture their knives giving you the best knife blade geometry, edge, and bevel. The Spyderco Tenacious is known as one of the top Folding Knife and is one of Spyderco’s most adored Knives in the world. If you are looking for quality craftsmanship in a respectable and tough knife that is quite affordable, then the Spyderco Tenacious is just right for you. 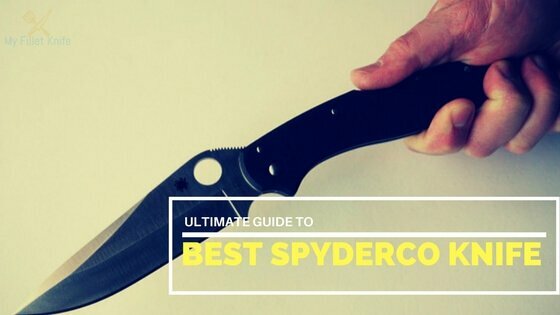 One of the best Knives for EDC would most certainly be the SpydercoDelica 4 Lightweight. One of the most favorite choice is well known for its high resistance. This is a knife can be used over and over again for a variety of functions as it is made to be utilitarian. 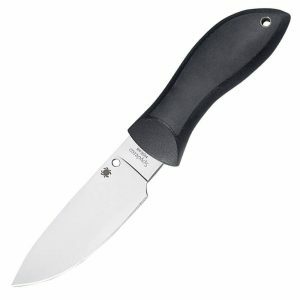 Designed by a famous knife makers Fred Perrin the Spyderco Street Beat is considered one of top Knife for Self Defence. The Street Beat is a small sheath knife that can be well concealed and provides an excellent fighting grip. Razor sharp, well balanced and comes with A Bolatronsheath which you can wear with a large variety of clothing types. This Pocket Knife is by far the best with its-its exceptional ball bearing lock and SpyderHole. This Knife also comes in a heavier or lighter weight model. The Spyderco Tenacious Plain Edge Knife is known for being one of the toughest Spyderco Knives that holds its edge very well. The stainless blade is leaf-shaped and ground flat from the spine for the best cutting performance. 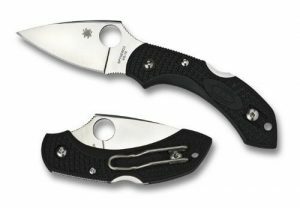 The oversized Spyderco Round Hole and textured spine jimping allow for easy and slip-proof opening. A sturdy and durable pocket clip. Very large and durable knife. A very large knife that takes up all the space in your pocket. A medium sized Tenacious Folding Knife from Spyderco with an ergonomically designed handle that reduces hand fatigue and a stainless blade with the non-reflective black coating. Blade handle designed ergonomically for easy and comfortable grip. A four-way pocket clip for a variety of carrying on options. The blade opens easily and confidently. A durable steel blade that holds its edge very well. Pivot screws came over tightened and the blade would not flip open. 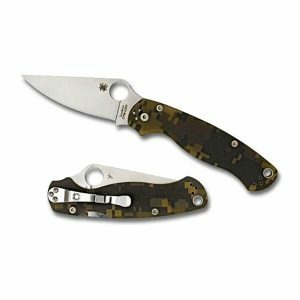 The SpydercoParaMilitarygets made from the highest quality materials for the toughest and most durable Spyderco Knife. This knife features a plain edge and CPM-S30V steel used for the blade. Tested for the best quality and durability & considered one of the top Spyderco Knife. A 14mm round hole for when you have gloves on. The clip-point flat ground blade comes modified for the best performance levels. A secure and safe nested compression lock. There are some inconsistencies in the finer details of the knife. This is a folding knife with the highest quality steel blade and a liner lock system along with a silhouette wire pocket clip. The edge of this Spyderco Folding Knife is ground flat for precise cutting and the handle is made from twill-woven carbon fiber for better grip capabilities. A flat ground plain edge ensures precise cutting. The twill-woven carbon fiber handle is easy to grip. A safe and secure Liner Lock system. A perfect EDC knife because of its light weight. The Very sharp blade that holds its edge well. The blade stains and catches your fingerprints quite easily. The Spyderco Dragonfly Plain Edge Knife is a light and compact folding knife with a leaf-shaped blade made from premium V10 stainless steel. Known as the perfect pocket knife, small enough to keep concealed in a pocket and large enough to function as a tough knife it should. Made from the finest VG10 stainless steel. A full flat grind blade for perfect sharpness and durability. Perfect size for the pocket knife and still tough. An injection molded fiberglass reinforced nylon handle with Bi-Direction patterns for the best grip you will find. The Screw on the blade tends to come loose. Beware of counterfeit products, there were some complaints about this. The Spyderco Southard is a well-engineered folding knife made from the highest quality materials. Easy to fold open and a reliable locking system. The steel does not scratch or chip. Very well engineered and the materials used are of the finest quality. Tested to ensure quality and durability. A flipper blade-opening device for easy opening. The blade is hollow ground. The Reeve integral lock system ensures a secure and safe lock. Beware of counterfeit knives make sure you have an original. The area where the clip screws onto the flame, are unfinished and do not have the same edge as the frame. 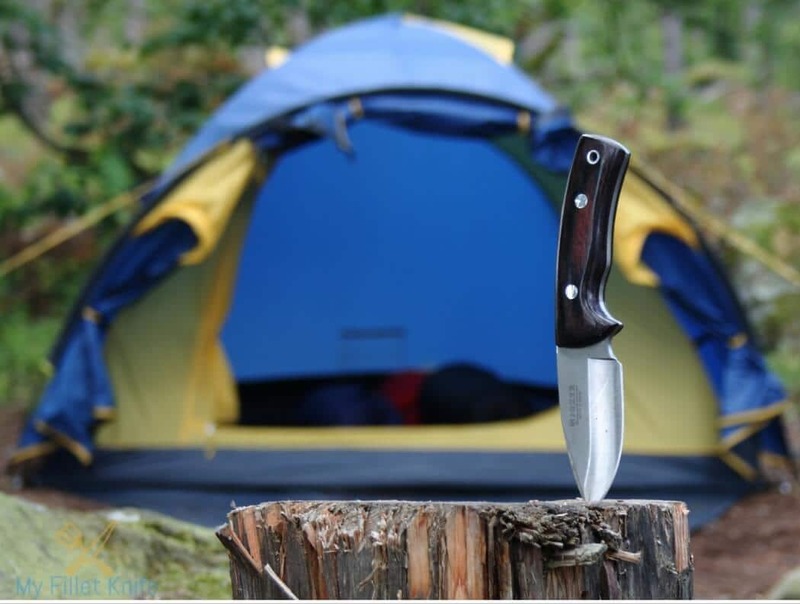 A lightweight hunting knives/camping knife that which is designed by the knife making legend Bill Moran. 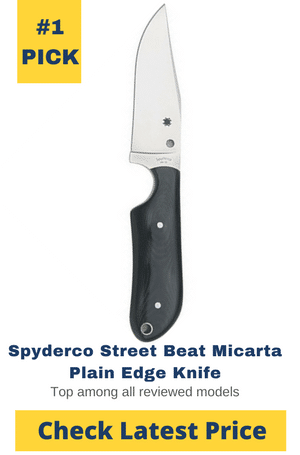 The drop point blade makes this the ideal outdoor knife, perfect for all types of chores & considered one of the top quality Spyderco knives for camping. A great size but still lightweight. Comes with a durable and reliable sheath. Can be clipped onto your belt. High quality for an affordable price. Very sharp VG10 Steel blade that holds its edge very well. The handle comes manufactured from injection molded reinforced fiberglass nylon for the best grip. The edge starts too far away from the grip. 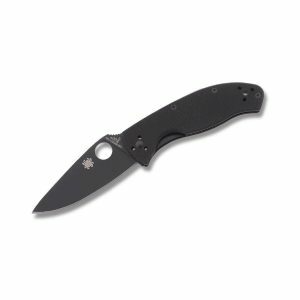 The Spyderco Street Beat Plain Edge Fixed Knife with 3.49″ Blade has an Injection-molded fiberglass-reinforced nylon handle and blade covered with black ceramic blade coating. 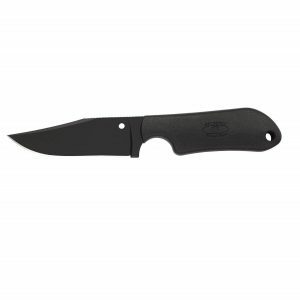 Lightweight with a fixed blade knife and comes with a durable sheath. A strong and durable blade that is fixed and lightweight. The Injection-molded fiberglass-reinforced nylon handle ensures excellent grip. Wel balanced and finished off. The belt clip is quite awkward. This great knife from Spyderco features a G-10 handle that is a bit narrower at the grip position for more slip resistance and a flat ground from spine to cutting edge for more precise cutting. The two position pocket clip allows for tip-up or tip-down carrying as well as a piped lanyard hole as another carry option. Well finished with a diamond-like coating. A securely nested compression lock with spine and choiljimping in a screw together construction. The new Pivot Bushing system makes opening and closing of the blade feel much smoother. The blade ensures clean and precise cuts. The coating on the blade stains quite easily and has an oily appearance. The Spyderco endura 4 is a lightweight knife with a flat ground plain edge. This knife has exceptional quality blade steel, is a perfect weight, comes extremely sharp out of the box and has a stunning appearance. The four-way clip with screw together construction allows for more carry options. The FRN Bi-Directional handle has textured detail for better grip capabilities. An enlarged opening hole allows for use with gloves. A tough and durable spine jimping flat ground blade. Deployment of the blade is not very smooth. What to Look For When Choosing One? When you are looking for a knife to every day carry with you the Spyderco is just right, you will always find a use for it. 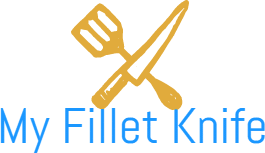 The blade knives come in either Black Electric Plating which is a non-reflective coating on the knife steel, DLC coating, diamond-like carbon or Titanium Carbonitride coating which is a ceramic film coating providing high abrasion resistance. Resembles a double-edged knife but sharpened only on one side of the blade. A secondary edge on the spine of the blade. The blade is ground with flat bevels from the center on. blade ground with flat bevels from the spine to the cutting edge. The blade comes ground with convex radiused bevels. The blade is ground with levels that have a concave radius extending to the full width of the blade. The bevel on the spine is unsharpened, considered as a false edge if it was sharpened. Similar to a full and flat ground but without a secondary bevel at the cutting edge. Similar to the Zero grind but the plane of the bevel carries on creating a cutting edge. A hollow ground blade that has a blunt tip. A primary cutting edge with a more curved belly and clipped point. A sharpened primary edge and spine. The Blades spine has a subtle convex arc to its point. The blade is sharpened on the concave side and is curved. A non-symmetrical spear point shape. The ground on the spine and angled. A blunt rounded tip and straight edge on the blade. An asymmetrical blade that has to curve on the spine and cutting edge. The point of the knife tapers down from the spine and meets the cutting edge in a straight line at the tip. Well concealed in your pocket. Molded Clip to form part of the knife handle. Made of stainless steel or Titanium. A spring-loaded barrel clip that has a release button. This clip is made from formed heat treated wire and attached to a screw or barrel bolt. A locking mechanism at the back of the handle. A more compressive lock that basically wedges the ball bearing between a fixed anvil and the tang of the blade. A spring loaded bolt locking mechanism. A lock bar developed by Chris Reeve a famous knife maker. Non-Locking the blade has a tab or lever from the tang from where it gets folded. Non-Locking the blade is held open by a spring joint. Custom made by Michael Walker. What Makes a Spyderco Pocket Knife So Special? The Spyderco knife is well known for its extreme edge holding ability and innovative designs. The ergonomics on the handle of each knife is also the best in its class. Manufactured from the finest quality cold steel using manufacturing methods that ensure not only the sharpest blade but also the best edge holding capabilities. The handles are made from the highest quality materials and are designed to ensure the best and most comfortable grip. Different locking mechanisms to choose from that give you 100% safety and surety that the blade will stay closed. Locking mechanisms also allow for easy opening of the blade. 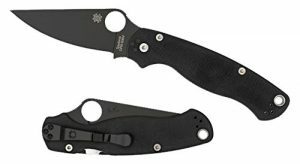 Spyderco does an exorbitant amount of research and development before deploying a new model of Spyderco Knife and relies very much on customer reviews and ratings. 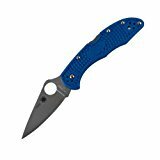 Best Spyderco Knife is designed to deliver the optimum levels of performance with the best steels used for the blades and well-designed handles and folding and locking mechanisms to ensure a safe and easy to use a knife. The Spyderco Sage Carbon Fiber Plain Edge Knife is one of the best EDC knives and stays extremely sharp holding its edge very well. 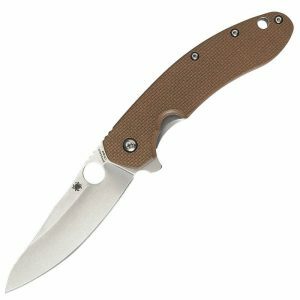 The Spyderco Dragonfly Plain Edge Knife with its VG-10 steel blade is one of the best pocket knives with a great handle for better grip. 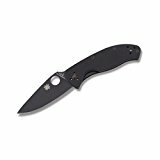 Lastly the Spyderco Bill Moran Drop Point Plain Edge Knife, Black, which is designed by knife making icon Bill Moran, is a versatile knife that can is excellent to be used in almost any situation, an ideal option for hunting and camping. I wants to buy a Spydecro Military knife. But I need to know these first. 1. What is a nested compression lock? 2. Is it good for lefties or not? Knew what I wanted, found it here, and owned it within days. Spyderco’s the best. You get more than what you pay for. Great value on the product and timely handling of my order by Amazon. Spyderco Tenacious Plain Edge knife is a workhorse, a great slicer, that has done everything I wanted. Exceeded my expectations in fit and finish. A great value. After owning this knife for some time now I am still quite pleased. It has accompanied me to Africa where it was used mercilessly. I have used it to everything from food prep to detailed carving. You will be hard pressed to find a negative review anywhere on any forum. The tremendous demand for these knives is well deserved, it is a terrific knife that I believe every knife enthusiast should own. 1. The “nested” compression lock means that the lock is in line with the handle scales. 2. You can use it left handed it is not as easy as right handed but it is still pretty easy.